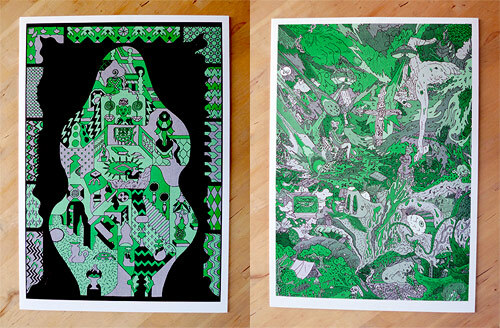 I’ve got art prints by Colin Henderson and Tommi Musturi to give away, courtesy of Landfill. These prints are part of a fundraiser to improve the facilities of MANYMONO – a Risograph based printing service for people who want to make zines, and prints. So far they only have equipment to print with green and black! If you want one of these prints, describe something green that you own in the comments below. Two winners will be picked tomorrow!